What Are The Gates Of Hell? What Does The Bible Say? Are there literal gates of hell? Why did Jesus refer to this term? Was it a particular place or just an analogy? Jesus once said “I will build my church, and the gates of hell shall not prevail against it” (Matt 16:18b) but what was He talking about? Are there literal gates to hell that can be opened up and where the enemy can send forth wicked spirits against the church? In the first place, the word Jesus used for “hell” was “hades” or in this sentence, “the gates of Hades” so what is hades? The Bible uses different words for hell and sometimes it refers to sheol, hades, gehenna or the lake of fire.” The Greeks were certainly aware of what hades was from their writings of mythology and since the New Testament is almost entirely written in the Greek, we know that the Greek word “hades” refers to “Hades or Pluto, the god of the lower regions” which is the nether world or the realm of the dead but could also refer to the grave or death itself. Whichever of these uses are used, the meaning isn’t changed; not even death or those of the “nether world” which could be demons or Satan will ever prevail against, stop or prevent the church from surviving. The other part of the Greek where Jesus said that “the gates of hell shall not prevail against it” (Matt 16:18b) is the word for “prevail” being the Greek word “katischyō” and this means “to be superior too” or “to overcome” so clearly nothing and no one (man, Satan, or his demons) can ever overcome Jesus’ church. That doesn’t mean that Satan won’t persecute the church and this means the individual members of the church as we will later read in the Book of Revelation. Satan has so self-deluded himself that he actually thinks he can take down the church but of course he cannot possibly do this. He can hurt the church, divide the church, and cause her great harm, but in the end, he cannot destroy the church. This seems strange because Satan is well versed in the Bible and he must know that his fate is sealed and that the Bible is clear that he will never take down the church but sometimes rage has a way of clouding reason, logic, and rational thought. When Satan (the dragon) tried to destroy Jesus as a baby he failed as His parents fled to Egypt for safety (Rev 12:1-6) and after war broke out in heaven, Satan couldn’t prevail against Michael and his holy angels (Rev 12:7-9) and he was so enraged by this that “the dragon became furious with the woman and went off to make war on the rest of her offspring, on those who keep the commandments of God and hold to the testimony of Jesus” (Rev 12:17) and that is most certainly Jesus’ church for who else keeps the commands of God and holds to the testimony of Jesus? “Her offspring” then is the very church that Jesus built and which He said the gates of hell couldn’t prevail or overthrow it. Later we read that “it was allowed to make war on the saints and to conquer them. And authority was given it over every tribe and people and language and nation, and all who dwell on earth will worship it, everyone whose name has not been written before the foundation of the world in the book of life of the Lamb who was slain” (Rev 13:7-8) but these verses never say that the church is destroyed. Many martyrs have and yet will lose their life for their faith but that never prevails against their entering the kingdom. Even today Satan has his own ministers behind the pulpits of many churches and you can tell who they are by what they don’t preach like on repentance, the blood the Lamb, the cross, the forgiveness of sins, and the security of trusting in Christ. This shouldn’t surprise us for it is “no wonder, for even Satan disguises himself as an angel of light“ (2 Cor 11:14). Satan is a liar and has been from the beginning (John 8:44) but the truth of God will prevail just as the church will. Paul warned that “the Spirit expressly says that in later times some will depart from the faith by devoting themselves to deceitful spirits and teachings of demons, through the insincerity of liars whose consciences are seared” (1 Tim 4:1-2). We know that the gates of death or hell nor anything or anyone else will prevail against the Church for Jesus is the Head of the Church and He prevails over all that He has created. The Church is no exception and so we can rest assured that not even the gates of hell will ever prevail against the Church. That means that even death itself cannot prevail against the saints of God because their destiny is as secure as the eternality of Jesus and all of His precious promises are yes and amen! Take a look at this related article: What Does the Bible Say About False Prophets? James Dobson explained this hard passage year’s ago. It helped me very much. The subject of the sentence in Mt 16:18b is the Church, Christ is building. The gates of hell are the direct object. Dobson explained that the gates of hell are not going to stand up against the Church’s attack. 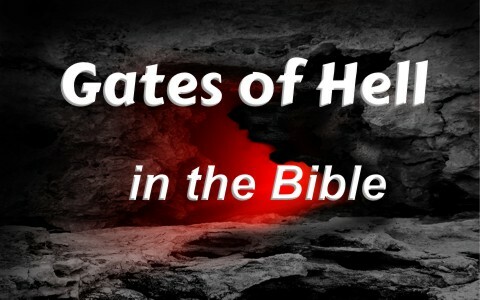 These gates of hell therefore would not be able to stand against “it”( the church). Wow…thanks Doc. That makes a lot of sense. Maybe that’s more of what I need? 😉 Thanks my friend. I think the ‘gates of hell’ are the White House! Previous post: Should Christians Worry About Being Politically Correct? Next post: Was The American (US) Constitution Really Based on Biblical Principles?